Welcome to our Stamp of the Month Blog Hop, and Happy New Year! We will be featuring January's SOTM, which is called Happy Valentine's, an elegant set of 7 stamps. If you have come here from MARY'S BLOG, you are on the right path! 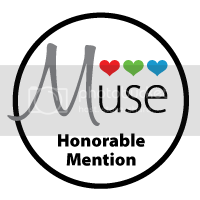 This month we have almost 50 Close To My Heart Consultants sharing their creations using this month's SOTM (and other great CTMH products) on their blogs. Hopping is simple to do - just click on the link at the end of the post on each blog to move to the next one! Here we go! This month I created a lovely little box that holds a coordinating accordion album using the (sadly) retiring La Belle Vie papers. That's right folks - this gorgeous paper is buh-bye at the end of January, so get yours ASAP. I random stamped the box base using the largest flower from La Belle Vie and Smokey Plum ink. There's the stamping! How pretty is that image, even not colored? I built flaps inside an altered Artiste cut box to help protect the precious album inside. I stamped the edges of the La Belle Vie Pink pages inside with second generation Smokey Plum floral images as well. It adds just the right touch of texture without overwhelming the small album. I used Slate Mini Medleys and Black Tulle to accent this elegant little album. The sentiments in this stamp set are truly beautiful. I accented this page with a resin rose that I snapped off a pin from the mini-medley and leaves trimmed from the Black Tulle...plus sparkles, of course! This is the third workshop of Volume 4 of my Stamping Rules Consultant Kits. For more details on my consultant kits, check out my Consultant Kits blog page! I'm linking this to the awesome craftiness over at Make It Monday on An Original Belle. Now "Hop" on over to ALLISA'S BLOG where I am positive you'll find an amazing project! Be sure to visit all the Consultants Blogs to soak in the great crafting and SOTM ideas! Remember, this SOTM is only available in the month of January. Contact your CTMH Consultant (or click here) to see how you can get this stamp set for just $5! Have you seen the adorable Whoo's Your Valentine special? Have I got a HOOT of a workshop for you! We'll be making 4 amazing Fun, Flippy, Fancy Fold cards and a cute little Box to hold them. The workshop is just $20, or two sets for $35, which is just the spot you need to be to get an adorable owl special of your very own for just $10! I'm linking this to the DIY Dreamer From Dream to Reality Linky Party. You should get over there to see all the fabulous Craftiness! Finally, I'm linking this to the Heart to Heart Fancy Fold cards Challenge, since every card in this set is a fancy fold card! 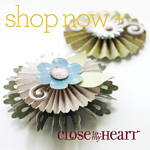 Includes Pre-cut papers, Sparkles, Glitter Glitz, and Burlap to make that fabulous flower! 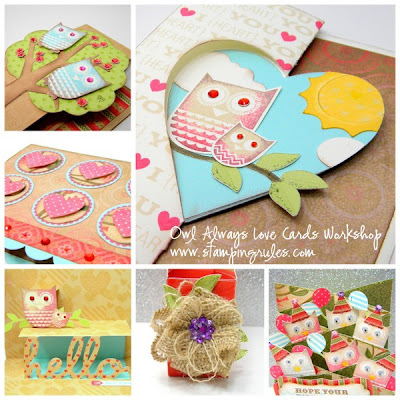 TWO Owl Always Love Cards Kits - Just $35 - best value! Includes materials to make two sets of these adorable cards plus boxes - and if you haven't ordered your Whoo's Your Valentine special, now you qualify to get it for just $10! Consultant friends, please visit my Consultant Kit page for Volume 4 Stamping Rules Consultant Kit info! RSVP by January 31st to join us for a hootin' good time! To go kits available for home crafting - additional shipping charge may apply. 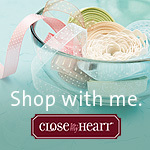 You are the heart of my business - thanks for stopping by! My hands are shaking as I type this post...I'm in the Spotlight on Jeanette Lynton's beautiful, inspiring blog! You can check out the post on Jeanette's Blog, and sign up to follow her there. She always has the most amazing art...I am so very honored to be featured there. I can hardly believe it's happening! I am so grateful for this, and for YOU, dear Stampin' Friends. Thanks for stopping by! Hello, Stampin' Friends Just a little peek of what I was working on yesterday while shopping that awesome Jamberry sale... Owl see you around! Good morning, Stampin' Friends! Congratulations to the winner of this week's giveaway for a free sheet of Jams, the fabulous Starr N.! Above you can see my current holiday Jams in Holiday Lights and Red Polka Dot...and a pudgy little 6 year old hand from my helper, Gabe, who is fascinated by Jamberry and often wears just one on a finger for the weekend at home when his friends can't see...good thing he doesn't read my blog! I hope to have a new art post for you soon - I'm working on the finishing touches for a new workshop kit! 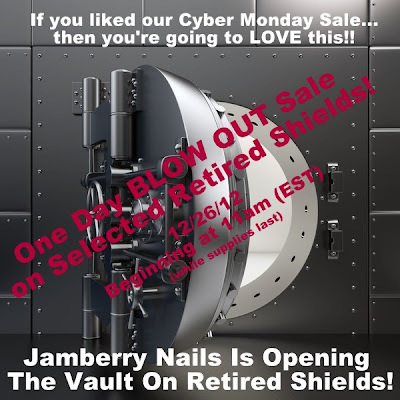 In the meantime though, Jamberry has announced they are going to open the vault for a new sale like the one we all loved on Cyber Monday! 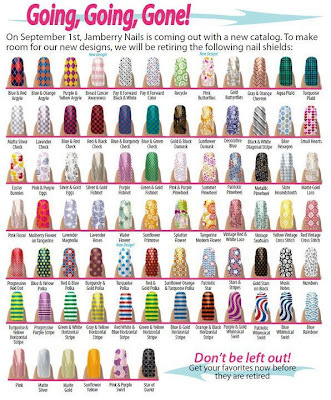 Super low prices and adorable retired patterns that went away before I even knew that Jamberry existed...woo hoo! I found this graphic depicting the retiring shields...I'll be stalking me some Small Hearts and Grey/Orange Chevrons. If you did the Cyber Monday Sale you know how much fun it's going to be! Jamberry puts up one design at a time in a limited number until it sells out, then post another until it sells out. Some of them went so fast you didn't have time to refresh your screen...and others not so much. The shipping on the special sale is free(!) which is great because you want to check out for each shield as fill your cart (or it'll disappear - it's not yours until you've checked out). If you want to play along, you might want to go out and create your Jamberry account online before the sale. You can do that without making a purchase so that checking out during the sale will go more smoothly! December has not been a great month personally for us with our steady stream of health setbacks, (2!) car accidents, the gluten disaster and subsequent loss of our beloved preschool co-op...but this week everyone is healthy again (phew! ), Christmas is almost here with family coming to stay (yea! ), a new CTMH catalog shipment (yippee! ), and now a Jamberry super sale (woo hoo!). Life is good! I was lucky enough to spend all day Sunday cropping with crafty friends. My club gals were working on these pages using the Pear and Partridge papers. I wish I was better at photographing scrapbook layouts. Each page is embellished using the new Glitter Rub-ons and lots of sparkles and Almond Glitter Glitz. I wish you could see the sparkle and shine! I'm planning to use this page for all my Instagram pics of the boys at various activities throughout the month. The journal strips on the left are for a list of my favorite memories of this month! This was my favorite page, with the stacks of "gifts" topped by Cricut Artiste bows. We made that glitter border on the right using a Martha Stewart punch and a lot of Almond Glitter Glitz! These photo mats are edged in glitter glitz as well. We did a lot of layering of Rub-ons on this page, and added in the Chocolate Cardstock. Thanks for stopping by, and don't forget to enter my giveaway for this week! I was so excited to get my Jamberry Giveaway posted that I didn't get to share this adorably simple card yesterday. I made it using the sketch from Freshly Made Sketches - they always have fabulous simple sketches! I still had my neon colors out on my desk from the Moxie Fab challenge card I just did, and apparently I wasn't done with that combo. Instead of putting the whole card on a gray background this time I marked out a rectangle with post-its and filled it with the open heart background stamp. I staggered the stamp to help the open hearts appear more random and filled them in with Silver glitz. I drew with my Cotton Candy marker around the edges of the stamped background and covered that with Silver Glitz so just a smidgen of the pink would come through. Then I added a Perfect Fit Frame with some popped up hearts in Lagoon and the sentiment in Cotton Candy. I love how easy it is to make them with the Art Philosophy cricut cuts! All of my adorable stamps besides the frame are from this cute Whoo's Your Valentine $10 special set. I know I'm not done stamping with this guy yet...I haven't even broken into the Treat Tubes and Glitter paper that come with this adorable set! Don't forget to check out my Jamberry drawing this week! I have more projects to share this week too - see ya soon! 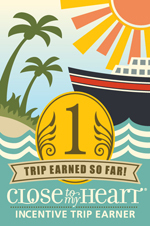 OK I was all set to post a CTMH giveaway for Friday Favorite Things this week when I suddenly realized that I just hit my first Jamberry Fast Start bonus goal! Just Two weeks and two days after I started! I can't tell y'all how very grateful I am for your support and I hope you are all enjoying your fabulous new nails! To celebrate I'm going to give away a set of Nail Shields (your choice!) this week on Friday. Just comment below with which set you would choose. Good luck - I've got to get back to stamping more Thank You cards! Whoo's Your Valentine Blog Hop! 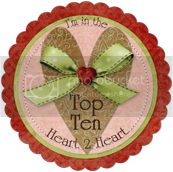 Welcome to our CTMH Whoo's Your Valentine Blog Hop! 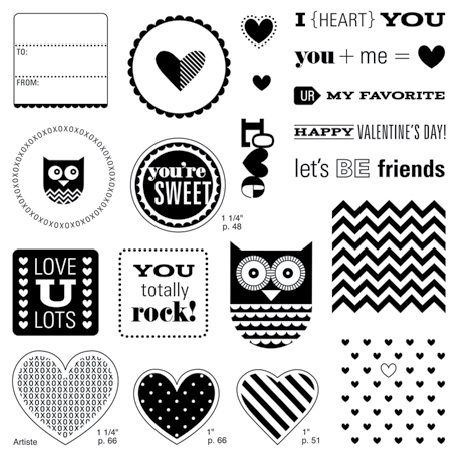 We will be featuring the new Whoo's Your Valentine special, which is a huge project kit that includes an adorable set of 21 stamps, treat tubes, glitter paper, and more for just $10. If you have come here from NIKKA'S BLOG, you are on the right path! We have over 30 Close To My Heart Consultants sharing their creations with this special set (and other great CTMH products) on their blogs. Hopping is simple to do - just click on the link at the end of the post on each blog to move to the next one! Here we go! For this card I used a sketch from Retro Sketches to create my project. I used Grey as my base because I can't seem to keep my paws out of the Whisper CS lately. It's just such a pretty shade of grey. I added some neon pink and blue to my paper pieced owl bookmark, inspired by the Moxie Fab World Keen on Neon Challenge. The super bright colors just pop against that gentle Whisper background. Did you see that my little owl is a removable bookmark? I found this super cute owl bookmark idea on a Norwegian blog pinned to Pinterest. I'd already decided what my card was going to look like, but as soon as I saw that pin I knew my owl was born to be a bookmark! I paper pieced the front of the owl using Cotton Candy and Lagoon inks, and then cut out the whole owl. Then I stamped an owl onto Whisper CS and trimmed it out with a small mat to form the back of my bookmark. I adhered only the top of the pink owl to the Gray owl with liquid glass so it'll be nice and sturdy - you just slip her over the page top to mark your page! I added Silver Glitter glitz accents to her beak and feathers, plus Bitty Sparkle eyes embedded in Liquid Glass for her eyes. I trimmed my faux polaroid frame from White Daisy CS and stamped the center piece with the chevron background image by inking it on the pad with a side to side swiping motion to add extra texture to the background. The sentiment is paper pieced and selectively inked to use just the words I wanted. This set has a bunch of sentiments! I used medium sparkles for the thought bubbles leading to my multi-layered stamped thought bubble. I finished off with some hot pink stitching around the card edge. I love that extra pop of pink! I'm linking this to the Paper Issues Shades of Grey Challenge...cause I loves me some Grey, and you should check out the fabulous projects going on there if you love Grey as much as me! Now "Hop" on over to DAWN'S BLOG to see her sweet inkspiration! Be sure to visit all the Consultants Blogs to soak in the fabulous ideas for this amazing $10 special! Remember, this $40 Kit is yours for just $10 with a $35 purchase! Contact your CTMH Consultant (or click here) to learn more! Check out some other Projects I've done with this kit! 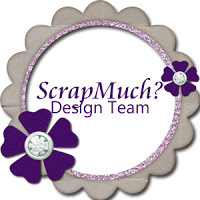 I was so excited when I was first approached by Tamra Pope to join her tiny swap group. The swap was only 4 cards, but boy, was there a doozy of a requirements list! Not hard to fill, just very detailed (must have at least 8 layers, must include a stamped background, no red/blue/green etc...) so it was kind of like putting a puzzle together! Here's my card, which I made using D1480 Snowflakes, Desert Sand and White Daisy CS, and a whole lotta bling! Here's a close up of the main layered snowflake. There is foam tape between two of the layers to help give the element some definition. 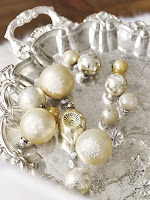 Even the button center is layered with a medium sparkle! I filled in the top Artiste cut snowflake with Silver Glitter Glitz, which I dotted and painted on throughout the background stamping as well. I even layered the fibers on the card, using both Color Ready Seam Binding and Grey Baker's Twine that I shredded on the ends.I had to use foam tape under this fabulous bit o' bling which actually came from the Haunted assortment. I even have my snowflake Jams on - can you tell I am hoping for snow? 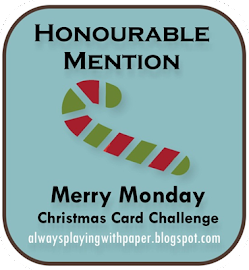 I'm linking this card to the Moxie Fab Tuesday Trigger challenge. How gorgeous is that silver tray? 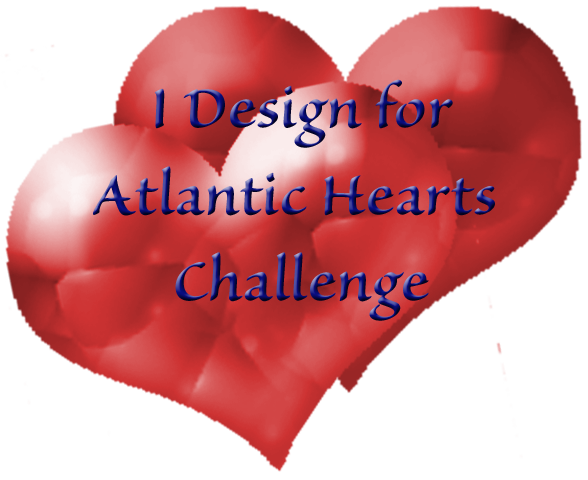 I'm also linking the to Heart 2 Heart Challenges Christmas Week 4 and the Hybrid Chick Holiday Card Caravan. Hope you are warm, cozy, and safe wherever you may be! I've got two tutorials for those of you who were waiting, depending on your attention span. At the top is a slide show with quick tips. Under that is the same photos but with step by step commentary on my experience applying Jamberry. I've added this to a permanent page on the blog for future reference as well! I'd like to take a second and thank all of you for your amazing support of this new adventure I'm starting. Since we are a crafty bunch, handmade thank you cards (with sample shields for practice purposes) were mailed off to you this morning. I you, fabulous Stampin' Friends! OK - I need you to remember these are my real nails - and I am notoriously hard on them. I've never really taken care of my hands. I am about as far from a hand model as you can get. I was more of a once or twice a year manicure gal...right before CTMH convention in the summer or maybe for my hubby's holiday party if I could find the time. I just couldn't see the point when I was just gonna ruin them in a day or two! 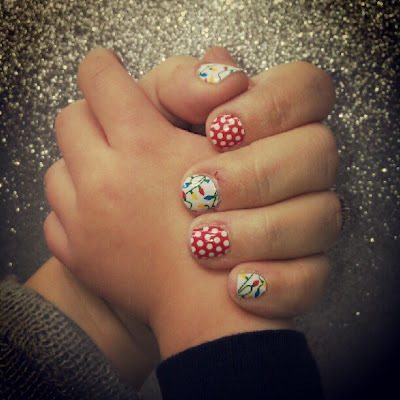 I'm so thankful that now I have Jamberry for fun, affordable, adorable nails that I can do myself when it's convenient for me and my family. Now, let's get our Jamberry on, ladies! 1. File your tips, push back your cuticles, and lightly buff/sand the tops of your nails beds to give the shields more texture to stick to your nails. Acrylic nails will need a coarser buffer, but natural nails just need a gentle, fine buffer. 2. Clean your prepped nails with polish remover or rubbing alcohol to dehydrate the nail bed a bit and remove filing dust. Some gals wash their hands with Dawn before applying. I haven't had to do that. I do use 100% acetone to clean them. 3. Trim the size you need out of the sheet, allowing just a little more than you need to get to the tip of your fingernail. This will save more material for more manis! I can usually do 2-3 nails out of each shield by trimming carefully, which is how I'm getting a complete mani/pedi from 1/2 a sheet! Don't forget you can trim the sides if needed to fit on your nailbeds. 4. Use tweezers to save your fingers if you have some. Heat each shield with your preferred heat source until it's floppy. The softer and floppier, the better your application will go. Stick it on and smooth it out. Add more gentle heat to the shield on your finger and continue to smooth. I like to use a rubber tipped cuticle pusher to help with this. Reheat as needed to get the smooth application you want. Note - I love this Lasko Heater so I can work with two hands the whole time and not have to balance my hair dryer on the counter. Some gals prefer the quieter rice bag method. You make a rice bag by sewing a little pouch out of material and filling it with a few spoonfuls of rice. Sew it shut, nuke it for 30-45 seconds, and you can use that as your heat source to apply the shields quietly while watching TV with the hubster - no noise, no smell! 5. Gently heat the tip again and pull/stretch the excess material at the tip to tightly adhere the tip of the shield to your nail. I stretch it in the center as shown, and on each side to be sure I'm good and stuck down all the way across the tip. Double check the sides and keep heating and gently stretching until you are happy with the smoothness. 6. Trim the excess with sharp scissors very close, right along your tips. Use a file to smooth the edges if needed, using a downwards motion, not back and forth. Wait an hour or so before applying Cuticle oil or submerging your hands in the dishwater for a huge amount of time so the bond has a chance to really set. They are "dry" immediately of course...and I'm honestly not so good with the waiting period sometimes, but it's what's recommended. To remove the shields I just reheat them a little bit and slowly peel them off. Sometimes there's leftover adhesive, so I'll clean my fingers with the polish remover and go again! They say if the shields aren't coming off you can soak in some acetone before removing, but I've never had that problem. They stay on until I feel like peeling them off, easy peasy! I was slower my first time, but now I can do both hands in about 15 minutes! Do you love the Red Accent nail? I'm going to need more of those Red Polka dots for sure! Ready for that giveaway? BTW - I'll be back to Friday Favorite Things crafty giveaways next week (yea!!) and I'm working on a new cash and carry area with stamps and kits too - woo! For this week, while I get back on schedule with my scrapbooking, I'm giving away a special sheet of Jamberry snowmen shields! You can't buy these, only get them by hosting a party or right here through my Rafflecopter giveaway! Hope you are having a joy-filled December!